Tender pieces of meat served with rich homemade sauces make meals that are simple to prepare yet impressive. Ideal for dinner parties or a special family meal, all they need as an accompaniment is a mixed salad or fresh vegetables. 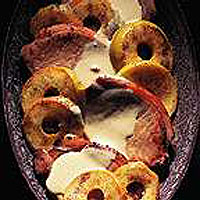 Pork loin steak cooks quickly and is complemented by the rich sauce and contrasting sharpness of the apples. Sprinkle the apples with a little ground cinnamon. Melt half the butter in a frying pan and fry the apple rings on both sides until lightly golden. Keep warm. Pan-fry the pork for 3-4 minutes on each side or until cooked. Transfer to a plate with the apples and keep warm. Add the remaining butter to the pan with the mustard, sherry, cream and seasoning. Stir until smooth, adding a little water if the sauce is a little too thick. Remove from the heat and serve immediately with the pork and apple rings.